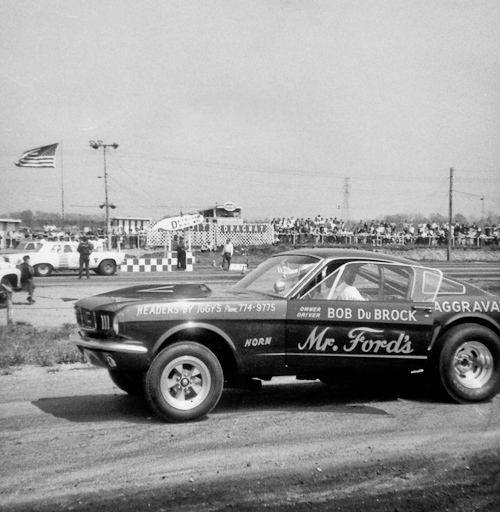 The next photo from the 1966 Detroit Dragway Funny Car Invitational is Bob DuBrock’s “Mr Ford’s Aggravation” Mustang fastback. I’m not sure what Mr. Ford had to be aggravated about, as the Chicago based car looks sleek and powerful. At first glance, the fastback seems to be nothing more than an assembly line ‘Stang. In reality, the little Mustang is an early Ford funny car. Note the extensive roll bar system. While the hot setup for Ford funny cars was the big SOHC engine, Draglist says DuBrock relied on a Ford 427 wedge. DuBrock ran the car out of Chicago and campaigned on the NASCAR Drag circuit. Yes, NASCAR sanctioned drag racing in the mid ’60s, and many home-brew match racers found the NASCAR drag circuit an advantageous place to race. In 1966, it was difficult to agree on exactly how a funny car should be built. NHRA originally resisted integrating funny cars as a separate eliminator and only allowed them to compete in the altered classes. With no input from the NHRA, early funny car builders threw away the rule book and constructed their match racers any way they felt like. Racers could pick and choose from a wide variety of racing elements; factory steel bodies, fiberglass bodies, fuel injection, superchargers, gas, alcohol, nitromethane, tube frames, factory frames; Funny cars were a smorgasbord of weights, designs, fuels and induction systems. The idea of “run what ya brung” was great when all the cars were more or less competitive with each other. Without consistent rules, however, cars were often mismatched, which didn’t provide a great experience to the people in the stands. NASCAR stepped up to offer a complete class structure for the altered wheelbase machines in their Ultra Stock division. The cars were divided up by fuel type, induction system and weight; so nearly every variety of match racer could race heads-up. While DuBrock could have been competitive at a NASCAR event, the Detroit Dragway Invitational meet merely lumped all the cars together, although I believe all the cars were restricted to pump gas. Draglist says DuBrock alternated between carburetors and fuel injection on the little Mustang. If he was only running carburetors, he would be seriously outgunned by the injected Hemis and “Rat” motors he was faced that day. Whatever DuBrock had under the hood, the Mustang failed to make much headway. The more radical Mopar and GM entries had too much of an advantage. Fortunately for Ford fans, DuBrock’s Mustang wasn’t the only FoMoCo entry that day. The Ford Hirisers were on hand with the Charging Cyclone Mercury Comet. And that will be the subject of the next installment. This entry was posted in 1966 and tagged Bob DuBrock, drag racing, Funny Car, motorsports, Mustang, racing history, Tom Bonner. Bookmark the permalink. Post a comment or leave a trackback: Trackback URL.